That’s what one American traveler told me in 1993 when I was early along in my first backpacking trip around the world. This meant he got a little scruffy sometimes, but he had pulled off the feat five times already in his year-long trip, in five different countries. Fast forward to now and you’d have some very long hair if you stuck to this rule, but if you adjust for inflation you can get pretty close. Occasionally you can still find that sub-$1 haircut too: when I was in Nepal this month I found a barbershop listing basic cut rates at 80 rupees: that’s US 80 cents. The usual there is more like a buck or two though and two of my friends paid $4 to get the full-blown treatment with a shave, head massage, and rough shoulder massage. 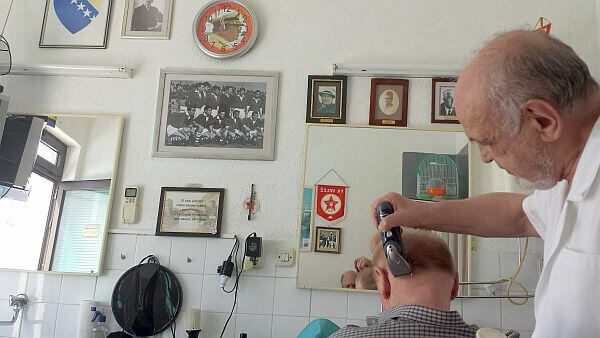 The picture above is the customer before me and the nice barber I paid 8 marks (US $4.70) yesterday in Mostar, Bosnia. It may be the best haircut I’ve gotten since the days when I had a full head of hair. He spent more time working on my sideburns than the Supercut stylists spend on a whole person’s head. I was in the chair for more than a half hour and I don’t really have all that much to cut these days. He was very particular. I didn’t speak any Bosnian and he didn’t speak any English, but no matter. If you’re a guy, you can get by with hand gestures almost anywhere. Granted it’s tougher for women, but judging by all the good dye jobs and haircuts I’m seeing here on women where the drapes wouldn’t match the carpet, there are plenty of good stylists around. You might need to bring an interpreter for these more complicated tasks though. Barbershops are always fun to visit in a different country to get a little insight into the culture. This guy had an odd mix of decorations, some of which I could figure out, some I couldn’t. A coffee table with a sheet of glass had three pictures of his granddaughter on it—and 12 pictures of football players. More local players and “Mostar Red Army” supporter memorabilia were on the wall, along with some guys adorned with a Turkish fez. There was a current calendar featuring the former general/president Josip Broz Tito, the last guy to lead an effectively unified Yugoslavia. Talk radio was about either sports or politics—all I could tell was that it was heated. When I lived in Turkey back in the mid-90s, three of us teachers went to get our hair cut by a local barber the same day. We paid around $2 each and all came back with super-short hair. We heard later that the guy used to be a barber in the Turkish Army. He did one thing I haven’t seen since: put lighter fluid on a Q-tip, lit it on fire, and stuck it in both ears. It singed off any hair sprouting around the ears, but we were glad we didn’t have any flammable wax buildup. Over my years living in Mexico, I’ve gotten many haircuts in different places and never paid more than $4.50. My main barbershop in Guanajuato charged 30 pesos most of the time and had raised it to 35 this past March. With the exchange rate hitting 20 to 1 at the time, that haircut was $1.75. When I lived in Korea teaching English in the late 1990s I usually paid $6 to $8, but it could have been much more if I had picked the wrong place. In some of the barbershops you apparently go for the extra services from a female companion, for additional fees of course. (For the record, it has been quite a while since I’ve stepped into a Supercuts. I have a favorite barbershop in South Tampa called Mannkind that hands you a glass of whiskey or a beer when you walk in and the magazines are all about cars, boats, and money. My kind of place, but it costs me a lot more than I paid in Bosnia. Where have you gotten a bargain haircut abroad? Anyway, keep writing such interesting posts. Look for someone with hair texture similar to yours whose cut you like. Ask him where he gets his hair cut. When you get to the shop be sure too tell them Joe or Pepe or Jose or Yossef or Giuseppe sent you. Just had mine cut here in Verona, by two Chinese. Only 11 euros! A deal! I love your site!!! I’m getting ready to order your book. I must say, you handle the negative comments people post very eloquently. Like many others, I wish there was a way to “like” some of your posts! I have a question for a seasoned traveler like you. Do you know if the “house sitting” sites are legitimate? Are there people across this planet actually posting to these sites to find someone to baby sit there home while they travel? I haven’t used any myself, but I know lots of others who have done multiple stays through Trusted House Sitters. They’re not the only legit one, but I’ve heard good things about them. This is an unexpected but cool article. 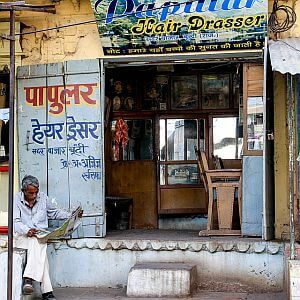 If you’re planning to stay in another country for a little while, you’ve got to know where the best and cheapest barbers are. Just like we search for them here. Thank you for the good read! It is still quite possible to get a very inexpensive haircut in Istanbul (and the rest of Turkey, for that matter). Usually the small neighborhood barbershops have the most reasonable prices. Whether you pick an inexpensive shop or a high-end posh coiffeur, having a haircut in Turkey is a unique experience visitors should not exclude from their ‘to do list’. Check this article (http://istanbulbarbershop.wixsite.com/bordon/about) out.